These four black and white photographs show the statues of the thirty-fourth President of the United States Dwight David Eisenhower, newspaper publisher William Allen White, twentieth Governor of Kansas and U.S. Senator Arthur Capper and aviator Amelia Earhart on the capitol steps in Topeka, Kansas. 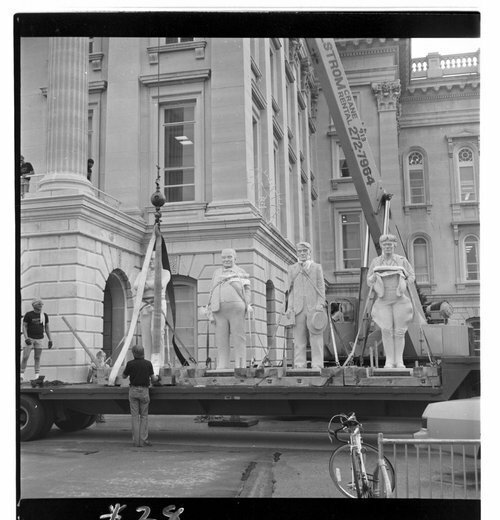 The 2,000 pound native limestone statues, sculpted by artist Peter "Fritz" Felten, Jr., of Hays, Kansas, were placed on the second floor of the statehouse rotunda.